Crytek GmbH (“Crytek”) is excited to announce that they will release their latest all-in-one game development solution CryENGINE 3 free of charge for non-commercial use today. The award winning SDK provides the complete game engine to create AAA quality next generation games for PC, and includes the CryENGINE®3 Sandbox™ level editor, a production-proven, 3rd generation “What you see is what you play” (WYSIWYP) - tool designed by and for professional developers. 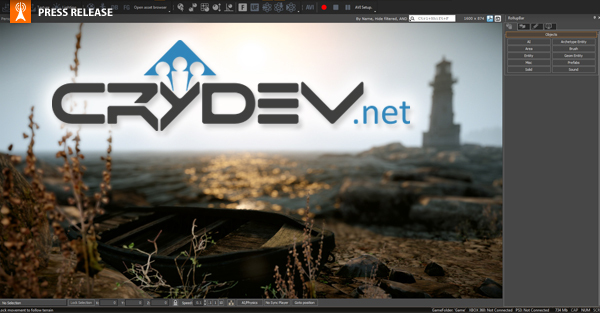 The free toolset is available for download at crydev.net, the former crymod.com community portal that offers documentation written by the developers of the engine, a thriving community and a supplementary knowledge base for CryENGINE 3. The free CryENGINE SDK will be updated regularly, to make sure our community has access to all the advances we make to CryENGINE 3. “With the release of our SDK we encourage creators to try out CryENGINE 3 and hope it will lead to new companies being formed and using our engine. More importantly we expect to increase the talent pool for CryENGINE developers, as well as boosting our online community of users. This SDK contains more toys than we’ve ever released before – it empowers people to create whole new games from scratch, not just mod Crytek’s own games, so we encourage all aspiring and indie developers to try it out.” said Carl Jones, Director of Global Business Development CryENGINE.